Lubomír Soukup received the M.Sc. degree in geodesy, cartography, and remote sensing from the Faculty of Civil Engineering, Czech Technical University in Prague, in 1986 and the Ph.D. degree in geodesy from the Faculty of Civil Engineering, Czech Technical University in Prague, in 1998. His doctoral thesis was focused to application of Bayesian approach to geodetic data processing. In 1994 he affiliated the Institute of Information Theory and Automation. He cooperates with Research Institute of Geodesy, Topography and Cartography. He was employed there between years 2006 and 2015 as a part-time researcher. He participated on projects InGeoCalc and Cartographic resources as a cultural heritage there. 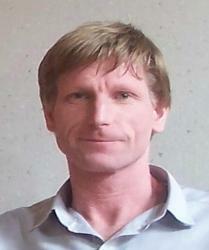 Research interests of Lubomír Soukup are devoted to Bayesian paradigm. He applies Bayesian statistics to image processing and spatial data processing. Special emphasis has been put on elastic image registration at recent time. Between years 2000 and 2010 he was teaching students of geodesy and cartography at the Czech Technical University in Prague, namely in undergraduate courses Adjustment of geodetic networks and Accuracy of geometric transforms. Nowadays he teaches undergraduate course Theory of errors an adjustment calculus at the Faculty of civil engineering at the Czech Technical University. This course stands for an introduction to estimation theory for bachelor students of geodesy, cartography and geoinformatics.